Civil Rights Icon Rev. Joseph Lowery Delivers Benediction at Obama Inauguration | Democracy Now! AMY GOODMAN: We’re broadcasting from the nation’s capital on this day after this historic inauguration. Yes, there was a great deal of controversy over Obama’s choice of Rick Warren to deliver the inaugural invocation because of his fierce opposition to gay rights and abortion. But Obama’s choice of minister to deliver the benediction was Reverend Joseph Lowery. Lowery is a towering figure in the civil rights movement. In 1955, he helped lead the Montgomery Bus Boycott. Two years later, he and Dr. Martin Luther King founded the Southern Christian Leadership Conference. In 1965, Reverend Lowery led the march from Selma to Montgomery. REV. JOSEPH LOWERY: God of our weary years, God of our silent tears, thou who has brought us thus far along the way, thou who has by thy might led us into the light, keep us forever in the path we pray, lest our feet stray from the places, our god, where we met thee, lest our hearts, drunk with the wine of the world, we forget thee. Shadowed beneath thy hand, may we forever stand true to thee, o God, and true to our native land. We truly give thanks for the glorious experience we’ve shared this day. We pray now, o Lord, for your blessing upon thy servant, Barack Obama, the forty-fourth president of these United States, his family and his administration. He has come to this high office at a low moment in the national, and indeed the global, fiscal climate. But because we know you got the whole world in your hands, we pray for not only our nation, but for the community of nations. Our faith does not shrink, though pressed by the flood of mortal ills, for we know that, Lord, you are able and you’re willing to work through faithful leadership to restore stability, mend our brokenness, heal our wounds, and deliver us from the exploitation of the poor, of the least of these, and from favoritism toward the rich, the elite of these. We thank you for the empowering of thy servant, our forty-fourth president, to inspire our nation to believe that, yes, we can work together to achieve a more perfect union. And while we have sown the seeds of greed, the wind of greed and corruption, and even as we reap the whirlwind of social and economic disruption, we seek forgiveness and we come in a spirit of unity and solidarity to commit our support to our president by our willingness to make sacrifices, to respect your creation, to turn to each other and not on each other. And now, Lord, in the complex arena of human relations, help us to make choices on the side of love, not hate; on the side of inclusion, not exclusion; tolerance, not intolerance. And as we leave this mountaintop, help us to hold onto the spirit of fellowship and the oneness of our family. Let us take that power back to our homes, our workplaces, our churches, our temples, our mosques, or wherever we seek your will. We go now to walk together as children, pledging that we won’t get weary in the difficult days ahead. We know you will not leave us alone. With your hands of power and your heart of love, help us then, now, Lord, to work for that day when nations shall not lift up sword against nation; when tanks will be beaten into tractors; when every man and every woman shall sit under his or her own vine and fig tree, and none shall be afraid; when justice will roll down like waters and righteousness as a mighty stream. Lord, in the memory of all the saints who from their labors rest, and in the joy of a new beginning, we ask you to help us work for that day when black will not be asked to get in back; when brown can stick around; when yellow will be mellow; when the red man can get ahead, man; and when white will embrace what is right. That all those who do justice and love mercy say Amen. REV. JOSEPH LOWERY: Say Amen. REV. JOSEPH LOWERY: And Amen. AMY GOODMAN: The Reverend Joseph Lowery spoke on Tuesday just feet from the former President George W. Bush. Lowery made headlines in 2006 when he spoke at Coretta Scott King’s funeral in front of four presidents, including George W. Bush. REV. JOSEPH LOWERY: Thank you, Coretta. Didn’t she carry her grief with dignity? Her growing influence with humility? She secured his seed, nurtured his nobility. She declared humanity’s worth, invented their vision, his and hers, for peace in all the earth. She opposed discrimination based on race. She frowned on homophobia, and gender bias, she rejected on its face. She summoned the nations to study war no more. She embraced the wonders of a human family from shore to shore. Excuse me, Maya. 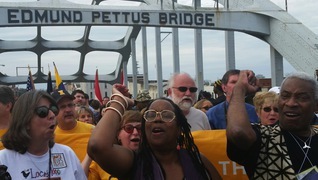 She extended Martin’s message against poverty, racism and war. She deplored the terror inflicted by our smart bombs on missions way afar. We know now there were no weapons of mass destruction over there. But Coretta knew, and we know, that there are weapons of misdirection right down here. Millions without health insurance, poverty abounds. For war, billions more, but no more for the poor. AMY GOODMAN: That was Reverend Joseph Lowery in 2006. He delivered the benediction yesterday at the inauguration.